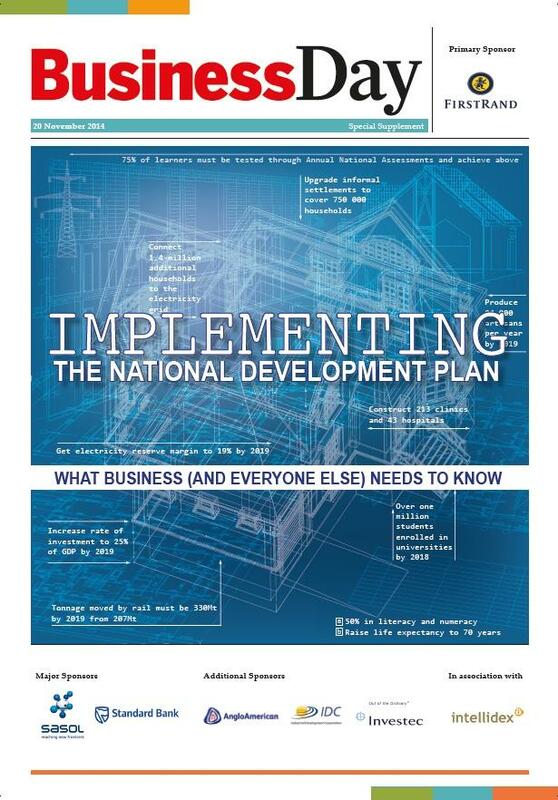 Intellidex’s second publication on the National Development Plan was published as a supplement in Business Day on November 20. Called Imple menting the NDP, What Business (and Everyone Else) Needs to Know, this is the second NDP report put out by Intellidex in conjunction with Business Day. While the first, published in December 2013, was an easy-to-read guide of what the plan is all about, this year’s publication is an assessment of the progress made in its implementation — by government departments and businesses. It also focuses on how the debate has shifted since the NDP’s launch. It includes interviews with influential roleplayers, but there is also a strong focus on how the NDP is affecting people and communities on the ground. The NDP encompasses targets and proposals in a multitude of areas, ranging from pre-school nutrition programmes to high-end economic goals. 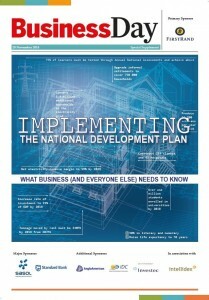 This publication touches on various areas where specific projects guided by the NDP are being put into practice. Little by little, it is making a difference, and that is something South Africans should celebrate. The publication doesn’t shy away from problem areas though: we highlight what they are but also show what processes or actions are being planned to overcome them. This publication serves as an essential read for business and government leaders to ensure they’re keeping pace with the changes the NDP is bringing and to assess where they can contribute. But it is also a must-read for all South Africans: without wide public support and participation, the NDP will fail. We have a number of copies available for educational institutions. If you are interested in obtaining copies for use in teaching or research, please email ndp [at] intellidex.co.za. Click here for the full supplement.